First came the action figures. Then the plushies, and the T-Shirts, and all the other paraphernalia - but this might just laud over them all as a testament to absolutely absurd Rocket Raccoon merchandise. Well, actually it is going to laud over them all, it's three feet tall. NECA announced this full-sized Rocket Raccoon earlier today, as a super special limited run - there'll only be one production run of them, presumably because they don't want the world to be taken over by hordes of foam Rocket Raccoon statues. The whole thing is made out of rubber foam and latex, so it's not as hefty as a typical statue, but that just means that NECA (who also categorised this as a Prop Replica, which kinda seems harsh on poor Rocket!) could go big and create Rocket to-scale, from the digital files used to bring the character to life in Guardians of the Galaxy. He genuinely looks a little creepy, but then I guess a three foot anthropomorphic raccoon is suppose to look creepy. I wouldn't want to see this out on someone's porch on a dark night or something, I'd probably have a heart attack. 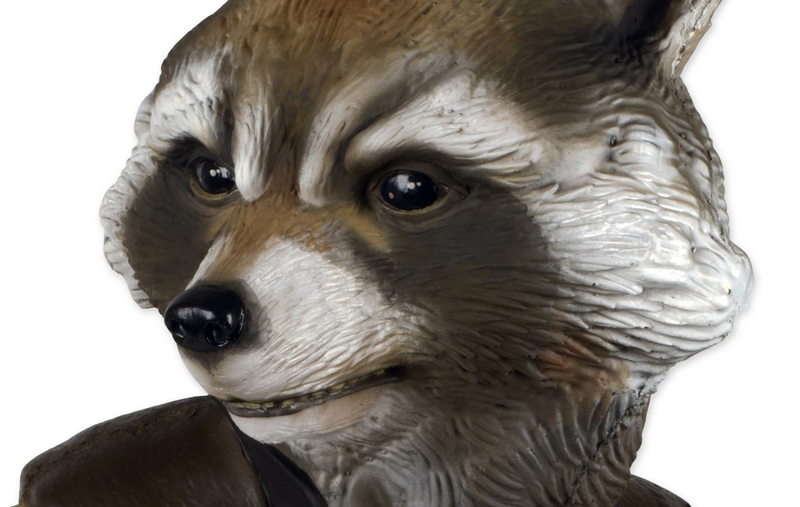 Or I might just have a heart attack at the price - because although NECA didn't include one in their reveal, websites have already put Rocket Raccoon up for preorder with prices ranging from 300 to 400 bucks (here's Big Bad Toy Store selling it for $350, for example). That's a lot of dollars per foam-Raccoon-foot. If you find yourself with a three foot Raccoon-shaped hole in your heart, Rocket will be available in January.